At the starting line, the impatient dragon lurches forward, “Crew, hold the boat,” yells the drummer.”Okay girls, this is your race, remember to breathe. Focus on your strokes, keeping in time with them at all times. Dig deep and hard, and remember to twist. Okay now, take a couple of deep breaths.” Twenty paddlers feel a quiver of excitement in their stomachs, knowing the race will begin, momentarily. “Attention!” calls the starter. Paddles up! Bang! ONE, TWOooo, THREEeee, the boat surges forward. The boat starts to glide across the water. The drummer continuously calling instructions and words of encouragement, “Reach out, dig, and make this dragon soar. You’re in command.” Bodies working together, using their paddles they skillfully, propel the dragon swiftly and efficiently through the water. REACH! TWIST!TOGETHER! “YOU CAN DO IT, YOU CAN DO IT,” she calls in excitement watching every member of the crew, pushing their tired bodies REACH OUT! TWIST!DIG DEEPER, HARDER. . . . . . . . . . . . . YOU’RE ALMOST THERE.FINISH! ONE, TWO- – – – – – – – – – -.”LET IT RIDE,” yells the drummer, as they cross the finish line.”YOU DID IT!”AND- – – why should that be a surprise? They have conquered a much greater dragon, BREAST CANCER. For me, it’s exhilarating as I sit on the drummer’s seat watching them execute each stroke in unison, their bodies working together as a team. I feel great excitement and pride seeing their sheer determination to complete the race. WE ARE A TEAM. SURVIVORS ABREAST ARE ALL IN THE SAME BOAT. Paddling or not, our HEARTS are full of love and compassion for our fellow members. Whether suffering physically or mentally it helps to have people to talk to or confide in who understand what we have gone through in this journey thru life. with your journey, through life. Our first large fundraising event for the dragonboat team was The Pink Ribbon Ball held in late October. This dinner dance with silent and live auction items was a classy, dress-up event. We held the ball three years in a row to raise funds for breast cancer equipment for PRHC. I was thrilled to be a part of this event. It was the first time I really had to declare that I was a breast cancer survivor in order to get people to donate prizes for our auction. I was impressed by the total commitment of all our members. As I was the decorating chair person I wish to thank again all those who pitched in to help me with the decorating. Many thanks to all. The circle represents the circle of friends I have acquired through Survivors Abreast and their companionship, love, understanding and support they give me. The dragon represents fortitude, determination and the wherewithal to get through life after cancer. My husband died one year before my diagnosis and my family is in England. My friends have been so incredible and supportive throughout these 2 major upheavals in my life. Without their love, support and thoughts the whole experience would have been so much worse. The fight is over. For how long, one never knows. We may shed one tear or hundreds, but that does not really help in the whole scheme of things. It will take an army of scientists, doctors and volunteers – plus a lot of donations to conquer this dreaded foe. I began dragon boating while I lived in Singapore and fell in love with the sport. I chose this fun-loving dragon because dragon boating has always been fun for me. At a time when I was a long way from home, it provided many happy hours paddling with other Canadians and paddlers of every nation; it became “my family”. My name is written in Chinese characters, and the silk used in the square is silk I brought home from Thailand. The pink ribbon represents the work I did in helping to start the first team for Breast Cancer Survivors in South East Asia, and my support for Survivors Abreast in Peterborough. Therese based her quilt square on a watercolour she painted while travelling to New Zealand with the Canadians Abreast Dragonboat Team. She was a devoted member of Survivors Abreast from the beginning of the team, and graced us with her zany sense of humour, her friendship, and her enthusiasm. 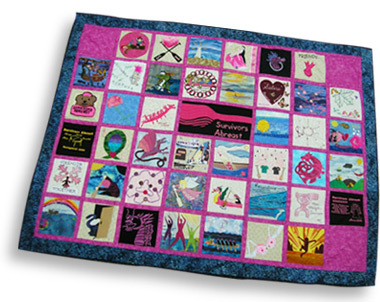 She was determined to participate in the quilt, despite her failing health, and she completed her square shortly before her death at the age of 80, in January 2006. My quilt square represents “Sisters” as siblings and in life experiences. The pink fabric I used was from the bridesmaid dresses my sister Judy and I wore at our younger sister, Pam’s wedding. The heart represents love we share. The two smaller butterflies outside the heart symbolize Pam and me and the larger butterfly is our Mom, as we would not be sisters without her. The butterfly inside the heart represents my sister Judy, who lost her courageous breast cancer battle July 7, 2005. After my breast cancer diagnosis, our bond was even stronger than it already was. 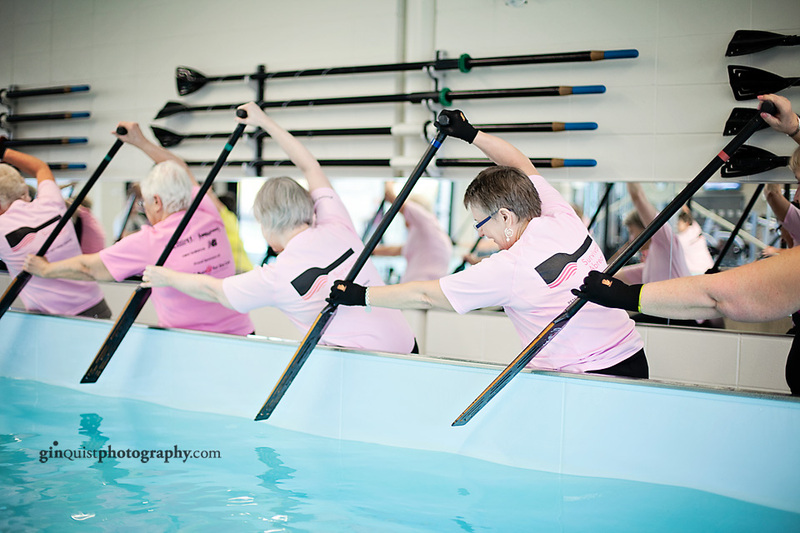 Judy encouraged me to join her, to be part of the sisterhood of Survivors Abreast Dragon Boat Team. Judy, you will be in all our hearts forever. A special part of the Dragonboat races is the Pink Carnation ceremony. After the Survivors race we pause and remember the girls on our team who are no longer with us. As we wave our carnations we remember their names and faces and although many tears are shed, we also know they are still a part of us. Part of their spirit will always be in our boat, part of their unique personality still makes us smile and try harder to win this battle against Breast Cancer. Someday the water will not be full of tossed pink carnations because we WILL triumph over this terrible disease. 1967 – Centennial Project – Our own farm came with a sugar bush. Making maple syrup, learning maple sugar and maple butter technique, teaching other sugar makers, showing maple syrup at fairs, judging, marketing and promotion of maple took over our lives. Always wore maple leaf or maple keys earrings. 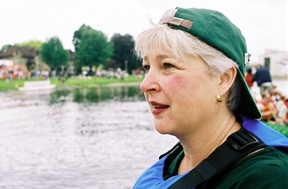 1997 – Breast Cancer – Don’t want lymphodema so in 1999 joined Helen Foote in inaugural Peterborough Dragon Boat paddlers with Len Minty, Meredith Cosburn and Sherry Vaughan. We always paddle with a buddy so doubled insignia from Vancouver 2005 Regatta. Now known as a dragon boat-aholic. While visiting at an amethyst mine near Thunder Bay fell in love with the purple quartz. When no longer wearing maple earrings for promotion promised myself to wear the gems in earrings and brooches. Amethyst is considered a healing property. Sharpens the mind, dreams and visions. Wearing of this gem was believed to prevent drunkeness. Amethyst is the official gem of Ontario. It has been my pleasure to dress “care bears” in personalized knitted team sweaters and caps for any team member who is experiencing a recurrence of her disease, surgery or some other particular stressful situation. My knitting garment tags over the years stating “Made Especially for You With Love in Every Stitch” has never been more appropriate since joining the Survivors Abreast Dragon Boat Team. A carnation floats on the water, Tossed from a dragon boat, By a brave, exhausted paddler, As a tribute to former teammates, As a bond with all Survivors, And a prayer for cancer-free women. A carnation floats on the water. It’s her personal symbol of hope. The hot pink of the square represents the colour of Breast Cancer awareness and for me all of us in the Survivors Abreast Dragon Boat together represent a strength we could not achieve on our own. This shared strength is a source of support that I find good for the soul. While I was going through treatment for breast cancer I kept thinking I have to make something good come out of this. I had surgery, then chemo and radiation at the same time and I was sick every day for over six months. Once I got going with the chemo and the radiation I wasn’t really afraid I was going to die, I was just wanting to make the best of a horrible situation. I did a lot of reading and went to a support group and had a wonderful computer friend who was living through a similar experience. I thought I should learn something or change my life in some way as a result of the cancer experience but I couldn’t seem to figure out what or how. After it was all over I realized that I had changed. I was weaker in some ways but stronger in others. Then I discovered Survivors Abreast. I had no idea how enjoyable it would be to move across the water in a long boat, paddling in unison with 20 other women. In my quilt square I tried to show the beauty of the water and the air as we paddle. It always seems to be sunny when we are in the boat. I always feel better once we get going on the lake during practices. It is wonderful to have the opportunity several times a week all spring and summer to enjoy nature and the lake with such a group. We often say we are a floating support group and it is true. 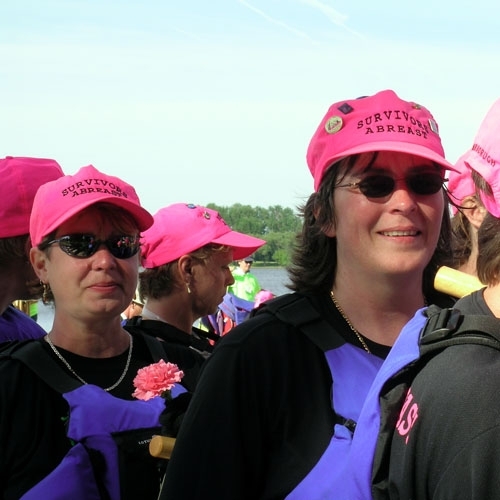 Dragon boating is certainly something good that has come out of my journey with breast cancer. My quilt square is built around a bracelet made by my dearest friend, who has been an amazing support and strength for me from diagnosis on! In addition, I have made mention of all the other supports that have helped me on this journey. Faith, Hope, family, friends and love have all helped. The other members of PDA have also given me courage and strength and I am grateful for the amazing ride I’ve had with them so far. Paddles up! The sun was shining and all was well in my life, until one day I noticed a red spot on my upper chest area. I was not too concerned but thought I should get it checked out. Still not sure what it was, my doctor sent me for a routine breast work up, or so I thought. The black cloud moved in. To my surprise I had breast cancer without lumps! The cloud got bigger. Then the treatment started and with it came a place called the lodge. Well this is where the sun shone again with the friendships that flourished. One woman in particular named Anne Munroe; we became very close supporting one another through out our recovery. Anne told me she was putting a team together for our dragon boat festival, Annie’s Oars, and asked if I could help teach her team the proper technique for paddling and of course I said yes. The next year I offered to paddle with them. Anne made these wonderful hats, with pink and purple feathers to celebrate the occasion. The feathers were beautiful, much like Anne herself. We all had so much fun. Then again the clouds became dark with the passing of friends from the team of Survivors Abreast, hence the tears falling from my dark cloud. Then the news of Anne’s illness coming back broke my heart. I use paddling as a way to get out my anger for this disease and taking away my friends. I hit the water hard. It makes me feel better. I still enjoy paddling for my health and get a great deal of support from my team mates. I also learn a lot from their experiences with the disease and treatments. My main goal is to raise the awareness that this could happen to anyone and we should all be aware, which is what I believe the dragon boat team does so well. The money we raise for our breast assessment centre is the best feeling to think that we have the best diagnosis equipment available for early detection. Anne has since passed away and I miss her dearly but each year I will help to keep her spirit and faith going by helping her team and continuing the great work of Survivors Abreast. Paddling means I am living. Paddles up. I was in my first year of Breast Cancer recovery and felt I needed to move on and help others. As Peterborough has the perfect Lake in the middle of the city, I thought Dragon Boating was perfect for our community. These are the people who sat down at my kitchen table to help me with my dream. My first quandary was what to do first, get the boat or the paddlers? I decided to jump in with both feet and the rest is history. 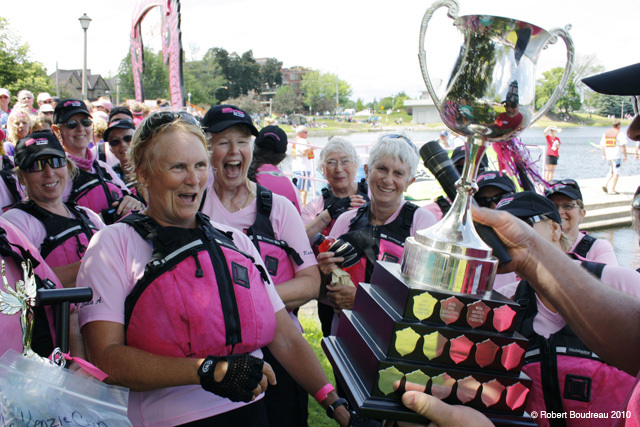 A year after the beginning of Survivors Abreast, our Breast Cancer team, was the beginning of our Peterborough Dragon Boat Festival with all funds raised staying in the community, support for everyone at the Peterborough Regional Health Care Centre and equipment for the Breast Assessment Centre. In 1997, I attended a free breast screening clinic, as it had been 5 years since having had a mammogram. My screening showed abnormal spots in my right breast. I was advised to have an operation to remove these calcifications in order to identify their properties. I hardly heard those recommendations. I do remember the instant fear, disbelief and emotional shutdown, and the numbness. As the surgeon was telling me what would be removed during the operation, I told him that I wasn’t going to do anything about it. It was at that point, I recall, seeing the surprised look on his face. My reaction was a result of my having become a widow very suddenly. I didn’t care about anything. The surgeon told me to go home and think about what I wanted to do, talk to my family, and to call him back in 2 weeks with my decision. The operation was done on June 30, 1997, with the results being cancer in the 2nd stage of growth. 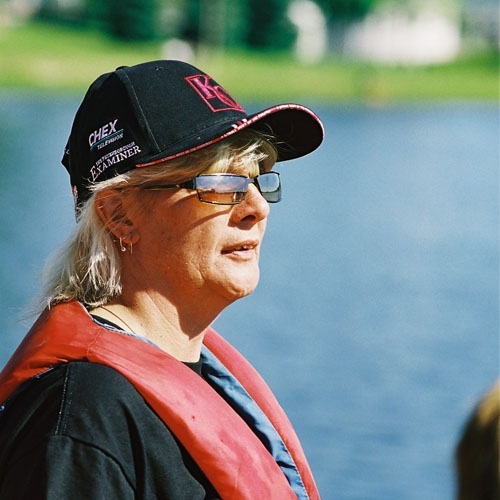 An article appeared in the newspaper asking for breast cancer survivors who would be interested in forming a dragon boat team with other fellow survivors. 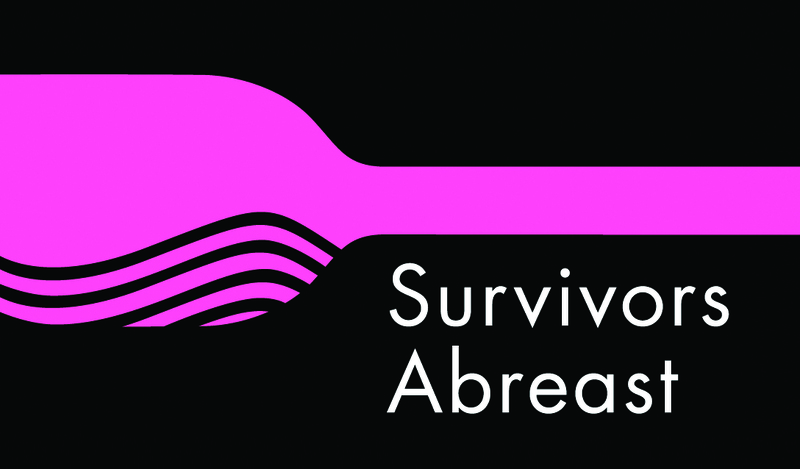 I called and am one of the original members of Survivors Abreast. This team has given me a lot since its inception. I have a group of people, some younger than myself, who understand what gift life is, how vulnerable I feel when I go for check-ups, the common insecurities of “what ifs”, the exhilaration of paddling a long, heavy boat, all together, to the beat of a drum and crossing the finish line, wet and exhausted. Dragon boating allows me to participate in living my life, in having my own sense of wellness, in knowing that I can offer hope, awareness and a sense of light heartedness to others, and be there for my fellow team members, as I know they are there for me. The outer shape represents the dragon’s body which encircles me not only by a common disease but also with a companionship of other breast cancer survivors. The dragon represents our coming together at dragon boat events, bringing awareness of hope and of possibility to others who have been diagnosed or who share the disease. The background is the colour of the sky and water. When I was diagnosed, my heart broke. With the love, support and encouragement of family, and being in the company of breast cancer survivors, my heart has become whole. The pink represents Survivors Abreast – my home team. The pink flower is a memorial to my family members who have died with cancer. Dragons, like the women I’ve come to know and admire since joining our team, are strong, creative, beautiful, full of hope and courage – and really like dressing up in bright colours and glittery jewels! Our boat arriving at Little Lake in Peterborough for launch and dedication ceremony in memory of my friend Sylvia Lee who died of breast cancer February 1, 2002. To honour the memory of team mates, their names are engraved on a brass plaque, which is affixed to the back of the drummer’s seat on our boat, so that they will always paddle with us. The unhappier times of our lives including diagnosis, chemotherapy and radiation. Our stronger and renewed life force. Our team camaraderie, combined strength and sense of purpose. A carnation in remembrance of those of our members whose race was victorious and is now ended. The teardrops represent all the heartache and joy that come along with your diagnosis. T-shirts represent our wonderful support team the Draggin Dawgs made up of very loving, caring, supportive family and friends. Without them it just wouldn’t be the same. 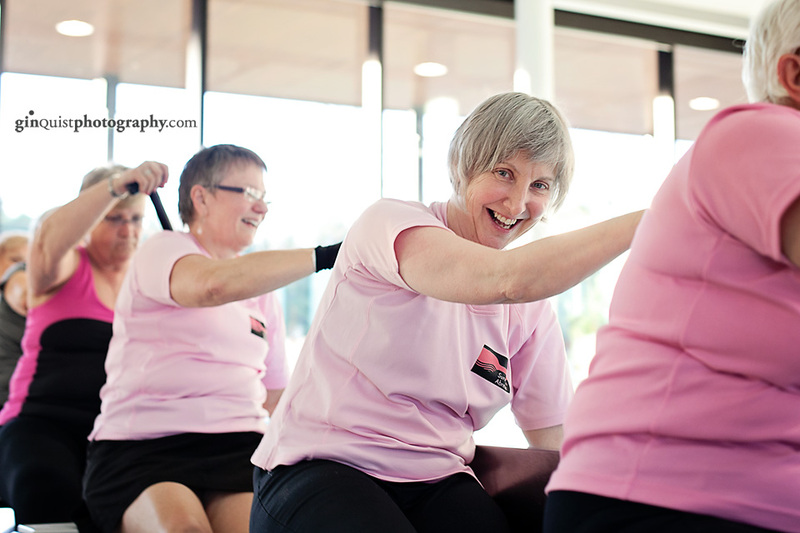 Survivors Abreast team shirt represents a very caring, strong, committed group of women. The dragon head is shown to support the Dragonboat festival which has been a great asset to the community and brings it together for a very good cause, to raise money for the Breast Assessment Centre. Dragon boating is hard work, but very exhilarating. We are all winners when we participate. Paddles Up! The dragon represents our sport, dragon boating. I chose the Celtic dragon to represent my heritage. The blue background is for the water we paddle on and the pink is for breast cancer. 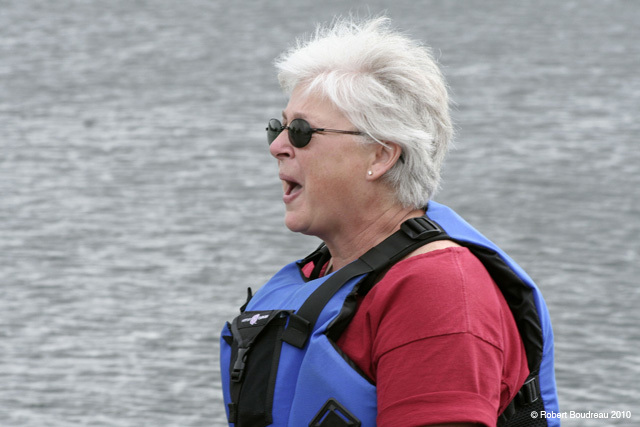 A few years ago, the late Betty Forde, a friend and breast cancer survivor and paddler on our team gave me a wonderful suggestion. She suggested that I tell my story, of how the breast cancer affected me, in picture form. This has been my first opportunity to take her advice. Pre-Diagnosis — Life was promising, dreams of – clear blue skies, green hills with beautiful flowers blooming, over looking calm waters. Day dreams of a future, of many sailing trips under beautiful sunsets. Diagnosis — Life became a dark place, all I could visualize was burnt grass on once beautiful hillsides, flowers no longer blooming, but faded and dried, little life. Dark dreary days, not knowing which direction my life was headed. Days waiting, tears being shed while waiting for the unknown. Recovery — A Survivor, rebirth, new beginnings – Beautiful sunny blue skies, a floating support group giving me hope, strength, a zest for life, living one day at a time but making every moment count. Maximizing life to the fullest. Being diagnosed with breast cancer was an overwhelming moment. Over the course of treatment and then moving on to enjoy and savour each day of my life, I have realized as never before the strength we draw from others.As always, the love and support of my husband Bob, our daughters Debbie and Tamara and their families and my father Harold Murduff helped to cushion the initial shock and gave me courage to face the challenges ahead. The skilled doctors, nurses and technicians made the future positive. The strength derived from my friends was immeasurable as were the random acts of kindness and support from people I hardly knew. 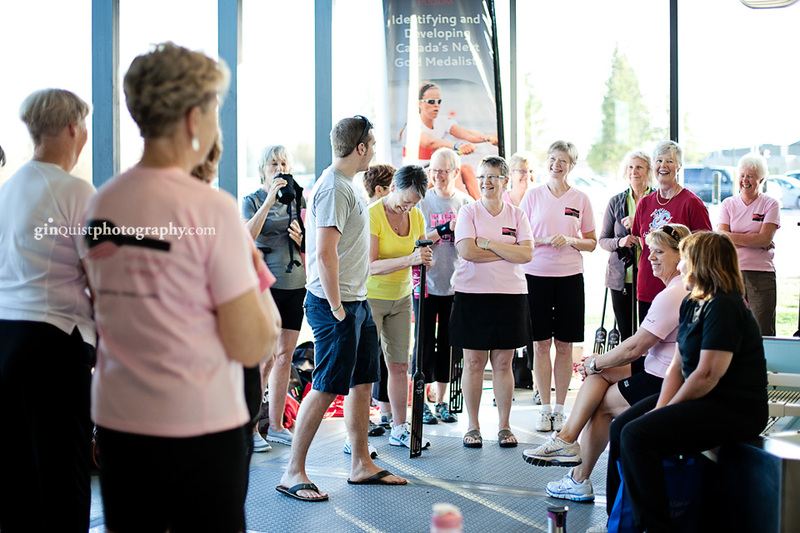 One of the most positive and inspirational results of being a survivor was joining Survivors Abreast Dragon Boat Team. The courage, the laughter and the tears that I have shared with one of the most amazing groups of women has enriched my life. The strength we derive from each other is indescribable. I also take great pride in knowing the money we have raised will make the diagnosis and treatment of those to come better. Thanks Debbie for sewing my square. Together we are stronger. My square originated from one done on the North Bay Survivors Team Quilt. I adapted it so that the figure in the boat was wearing a pink hat and this is the focus of my square. 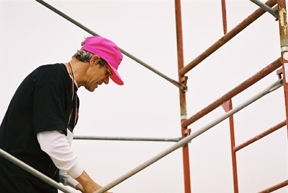 Our team is recognized by our bright pink hats. When I joined three years ago, I found it very difficult to keep that hat on my head, as I simply dislike wearing hats of any kind. The hat often found itself on the floor of the boat, shortly after we paddled from shore. I now see that hat as a symbol of my fighting cancer. I may not want cancer, (like the hat) but I have had it, and so I will wear my hat proudly, as a reminder that I am a cancer survivor not a cancer victim, belonging to the Survivors Abreast Team, for the exercise, knowledge and support that I receive, as we all paddle together. My angel symbolizes the protection and support I was so lucky to have at the time of diagnosis in 1994 and onwards to this day. I remember right after my husband gave the bad news to my Dad on the phone, Dad rushed over to comfort me. He told me not to worry, that he’d been in touch with two angels in heaven, my mother and my grandmother, and that he’d asked them to look out for me and so I would be O.K. He was very convincing and I’ll never forget how reassured I felt.The angel also represents my “earthly” angels who gave me so much loving support, Dad of course, my dear husband Wayne, and children Hayley and Chris, my brother and other relatives, friends, and colleagues at work. My oncologist in Toronto is very busy now as head of oncology at a big Toronto hospital and does not usually see her “well” patients for their regular check-ups. Instead, I see Dr. Hassleback, a semi-retired oncologist, a jolly, father man with twinkly eyes and a white beard; he reminds me of old St. Nick. Once, when I was particularly worried about my prognosis he reminded me about my immune system and how it would be protecting me. I was taken aback that a doctor practicing traditional medicine would be so wise! I count him as one of my earthly angels too. My angel is holding a paddle, which represents the support I get from Survivors Abreast dragon boat team. Joining the team gave me a new focus and helped me to keep physically and mentally fit. A real bonus is the wonderful camaraderie this group of gutsy ladies enjoys. Win or lose the race! Because getting into the boat is winning! It was during the ceremony at last year’s Dragon Boat Festival, the first in which I have participated as a member of Survivors Abreast, that I really became aware of how extensively breast cancer has occurred in my family.The top part of my square represents the sky and those who have passed from this world as a result of breast cancer. Veronica Butcher was my son-in-law’s mother and the grandmother of three of my grandchildren. Marilyn Finn was my husband’s sister, Margaret Cooper was my brother’s mother-in-law. Two of her daughters, Jean and Judy, also succumbed to the disease. Therese and Judy were team members who have passed since I joined the team. The names in the centre part of the square are children and grandchildren of myself and the people whose names are in the top part of the square. You will notice that two of my granddaughters have the yellow of Grandmother Butcher’s name as well as the Breast Cancer Pink representing my survivor status. I hope with optimism that our disease will be conquered before any of them becomes affected by it. The bottom part represents the spirit of our team as we surge forward in dragon boating and life. There is no limit to the number of positive adjectives that can be applied to my team mates. They are caring, clever, compassionate, encouraging, energetic, fun to be with, interesting, helpful, talented, etc. and great cooks too. I find that quiet times on the water in the boat (when we are regaining our breath and can’t talk anyway!!!) are wonderful moments of reflection – to remember those who have gone before us, to think loving thoughts of strength and optimism for their, and our, children and grandchildren and our team mates and to be enormously grateful for our super supportive organization. hold on to what you know is true this is a hard time but do not set aside all of your hopes. Everyday things will be a bit clearer. Remember Your Dreams. Do not let go of your dreams. My daughter gave me a card with this message – I use it as a mantra to see me through difficult times. Melissa & Chandel gave me the courage to join the amazing women who areSurvivors Abreast. Warrior women who are an inspiration to others who are on the journey to a future of health and personal growth. 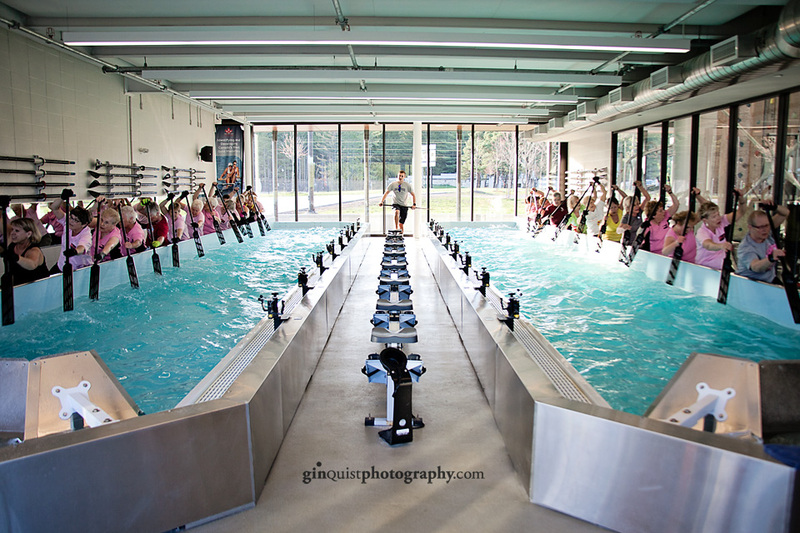 Warriors paddling as one… sharing laughter and tears providing hope and strength. I have been truly blessed. 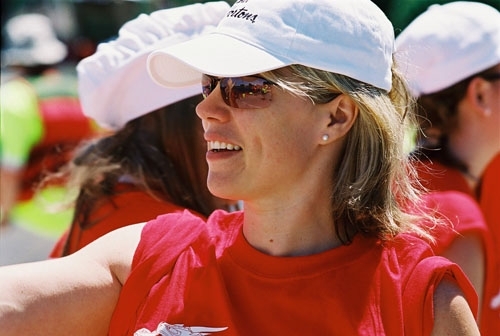 Each year at our Dragon Boat Festival our Survivor Ceremony features a song by Sarah McLachlan, “I Will Remember You”. After the song, pink carnations are tossed into the water to remember and respect those who have passed. We become very close with our paddling sisters and remember them often, their happiness, families, struggles and fears. With my Quilt Patch I hope we will always remember our team mates and be reminded that everyone must be vigilant about their health. Early detection is all we have. Black and pink are our colours! Earth energies are your heritage, love it, use it,heal it! When I was 33 years young, I lay down one night, put my hand absently across my chest and jumped when I felt a lump. The rest of the story, as with everyone, was a nightmare! I had to wait six weeks for surgery and it was all or nothing, no lumpectomies in those days. I had a three year old, who had just got out of Sick Children’s in Toronto, a Father who had just died of Cancer exactly one year ago, and three family members who had Breast Cancer. Only my Mom was still alive. So, I woke up and the breast was gone and they said the ovaries had to go too. I went into denial from that day on. I went back to work two months later after a mastectomy and hysterectomy, I looked after my family like nothing happened and I wore very unrevealing clothes. I am still self-conscious of having only one breast. Then, six years ago I was given the book “How to Ride a Dragon” and my life changed forever. I found out there was a dragon boat team in Peterborough that I never knew about. I couldn’t wait to join. Folks asked me what I was doing on a breast cancer team and I was proud to tell them, “I am a SURVIVOR.” I continue to learn from the courage of so many on my team. Individuals dealing with breast cancer need to feel inspired. Our ability to lead active and full lives gives hope to other cancer patients and their families when they see us in a Dragon Boat Festival. Racing in Breast Cancer races is not about the winning, Its about the friends that we make, The hugs that are shared after the race, The support and words of encouragement given to each survivor, No matter who came first across the finish line. We are all winners just by getting in the boat. Honour… for our mothers, sisters, friends, teammates and all the women of the past who have battled with breast cancer. 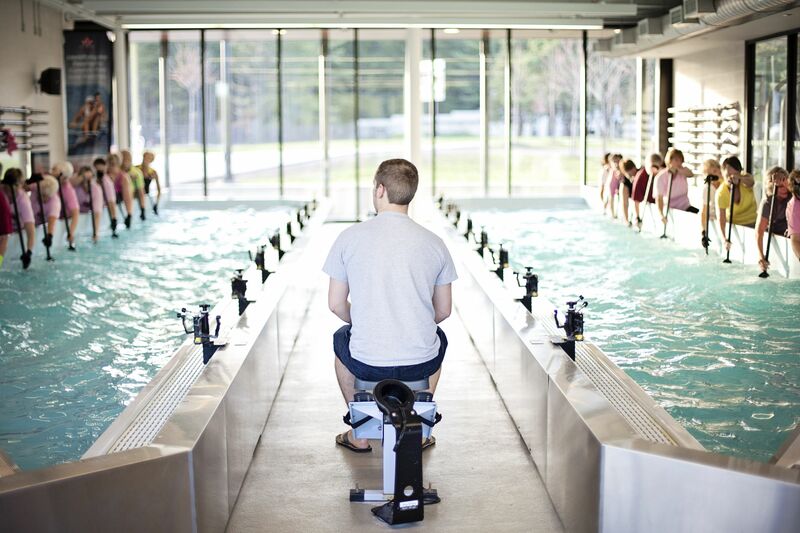 Strength… physical through our paddling and emotional through our support of one another. Hope… through our fundraising efforts, that in the future more women will remain cancer free because of access to better diagnostic equipment and treatments. It is the year 2000 and I have just been diagnosed with Breast Cancer. 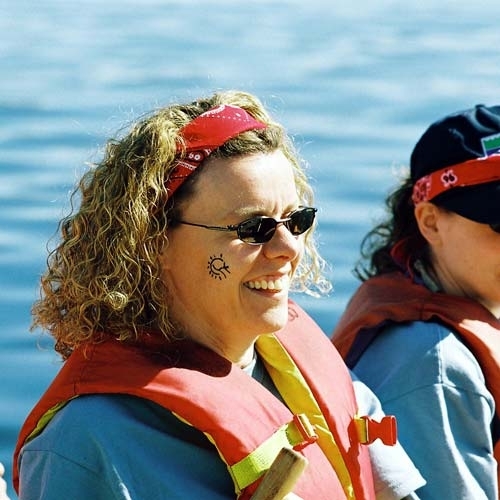 I have the love and support of my family and friends, as well as 2 quilt guilds (Bobcaygeon and Buckhorn), but as I am going through chemotherapy and radiation … Gord Wilson tells me about the dragonboat team that his wife, Heather, belongs to … He says it is great exercise and a lot of fun. I check it out and join right away and suddenly I have a 3rd support group, they have all been through this and know exactly how I feel. Just when I need an extra hug I get it and they all help me beat this dragon. It is the year 2003 and I have just been diagnosed again with Breast Cancer … I am in good spirits … the courage that everyone gives me is amazing and I know with all this support I will beat this dragon too. I am so proud to be on this team of amazing ladies … I am so proud to be part of “Survivors Abreast”. Now it is 2005 and I see a “Survivor” quilt at a show … I know we can do this and I have a dream. Everyone helps me make this dream a reality …but I am having trouble finishing my block and writing my story. It is 2006 and I have been diagnosed again with cancer, this time my lung and liver. I understand at last what my block means … God has given me a 4th support group … He knows I believe in angels and is letting me know that they are up there helping me to fight this dragon too. My reason for a nice lacey, racy, bra on my quilt square is: Breasts and bras represent womanhood, motherhood, sexual feeling and a woman’s identity. It is so very important for women to not just cherish their breasts but to take very good care of them. Self-examination, partner examination, Doctor examination is imperative. On top of examination, mammograms at 50 should be de rigeur, before 50 in the case of familial breast cancer or if a woman has a concern. That said, as a woman who has had a bilateral mastectomy (both breasts removed) I have found that with a lot of love, support and personal evaluation, a woman can still be the woman that she has always been and I think in my case better.